Fiction – Kindle edition; Bodley Head; 320 pages; 2012. R.J. Palacio’s Wonder is one of those rare “crossover” books with universal appeal. It is aimed at children and a young adult audience, but it is such a gorgeous story — one that genuinely warms the heart and brings tears to the eyes — that it has quickly rocketed to the top of my favourite reads of the year. 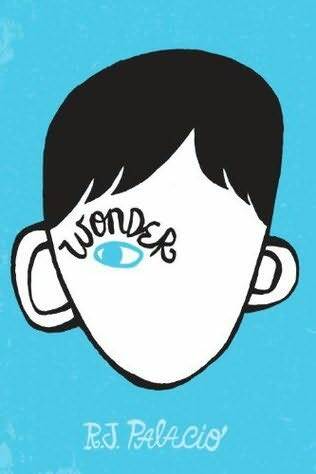 Wonder tells the tale of 10-year-old August “Auggie” Pullman, who was born with a serious facial deformity. He has been home-educated, but now his parents think it is time he attended a mainstream school. The book chronicles his efforts to fit in and become accepted by his peers at Beecher Prep. My name is August. I won’t describe to you what I look like. Whatever you’re thinking, it’s probably worse. When the book opens, Auggie narrates his experiences in a voice that is engaging, humble and honest. He conveys the fear of meeting new people and seeing their reactions to his face. He knows why people avoid or shun him, and while it hurts, he accepts it as a normal part of his existence. Despite the fact he’s had 27 operations, “eats like a tortoise” and has cheeks that “look punched in”, there is nary a trace of self pity. Other characters in the novel — including Auggie’s older sister Via and his friends Will and Summer — take it in turns to narrate the story, so that you get to see Auggie from a range of different perspectives. Despite Wonder being aimed at a far younger audience than me, I absolutely adored this book. While I did feel emotionally manipulated on occasion (I cried several times and the ending just killed me), I truly didn’t mind. That’s because I think the message behind the story — that you should not judge people on looks alone and that we should all be kind to one another — is an important and universal one. As an adult, it was nice to be reminded of that. Yes, the book has some “Americanisms” and yes, I sometimes felt characters adopted a patronising tone with Auggie. But as a book to pull the heart strings, make you think about the world in a slightly different way and get you to appreciate your own good health and fortune, I could not think of a better read. I not only fell in love with Auggie’s lovely nature and bright personality, I also fell in love with his charming, supportive family and his generous, open-minded school principal, Mr Tushman. Of course, the book isn’t all sweetness and light, because it also features some horrible people, including school bully Julian and his shallow mother, who tries to (unbelievably) Photoshop Auggie out of the official class photograph. But without them, the story would lack the tension and the drama that makes it so emotive and readable. Essentially, this is the kind of book you just want to rush out and tell everyone to read — I’ve already ordered my eight-year-old niece a copy. If you’re intrigued by the sound of Wonder and wish to find out more, do visit the author’s official website. Note that an adult edition of the book will be published in the UK by Black Swan on 1 August. I am reading this book to my Year 5 class at the moment. It is a great avenue for discussing social justice and I too am hoping that my students will see the message of being kind and valuing each other. A great book! I am so glad you enjoyed this book as I also loved it. I bought it after reading an interview with the author in the Guardian and have since bought it for my mum (74) and my two nieces (11 and 14) and they all loved so it really seems to be a book that appeals to all ages. I find myself often thinking of, and trying to apply, the central message of the book – to be a little kinder than is necessary. I’m really intrigued by this book. I have a ten-year-old godson with a facial deformity who loves to read and have been debating getting him a copy, but I don’t know if it would be a misplaced gift, perhaps a little too close to the bone for him? I think he’ll either love or hate it. I’ll have to give it a try for myself first and see! I can imagine this would be a great book to read to a class… so many things you can discuss… and I’m sure the kids get a lot out of it. It’s just a lovely story, isn’t it? And filled with so many universal home truths. Just the fact you’ve bought it for your mum and your nieces shows the large age group the book appeals to. I think anyone aged 9+ would get something out of this story. “Yes, the book has some “Americanisms” ” Is that a bad thing? It made me laugh because I point out much the same when reading a book by a British author. I’ve always felt emotional manipulation in a book is hard to judge. It’s an effect the author is working to achieve. It doesn’t just happen organically: they wanted readers to fall apart in certain places as a culmination of story, language, character and everything else. It certainly is a unique sounding book. I loved this book too – it was manipulative, but in a good way. Those parents eh! That really got me. Love finding quality books for kids – my daughter is 7 and already a voracious reader so I am constantly adding to TBR of books I want to introduce her to as soon as she’s old enough. I think in a couple years she will love this one.